ProQuest Central (PQC) is a large multidisciplinary research package which includes News, Business and Market Research databases, alongside Arts, Medical, Science & Technology and Social Sciences Collections. We have been able to negotiate an extended trial to PQC for 18 months starting from the 1st of March 2018 to August 2019. ABI / Inform – key journals, company records and forecast data, plus business news publications including The Wall Street Journal, The Economist and The Financial Times. Business Market Research – company, industry, economic and geopolitical market research from Hoover’s Company Profiles, OxResearch / Oxford Analystica, and Snapshots. ProQuest News and Newspapers – local, regional, and international news coverage. We already subscribe to Arts Premium, which makes up a large part of this package. Read more information about ProQuest Central. 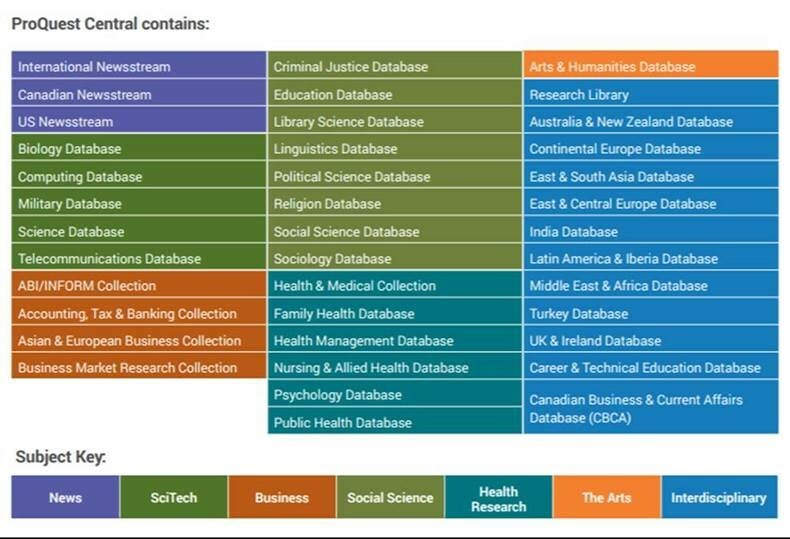 During this trial we will be evaluating PQC against some of our existing e-resources, as well as looking at the health and social science resources contained in this package. We welcome feedback from academic staff and students on PQC content. Please email e-info@arts.ac.uk, and include the text ‘PQC’ in the subject line.